Practicing yoga before bed helps you to wind down, relax and stretch out. A simple bedtime yoga sequence along with deep breathing will help you to calm down and relieve all the tension at the end of the day. This little session before your bed time will not only help your body but it will also help you get a good night’s sleep and wake up refreshed. 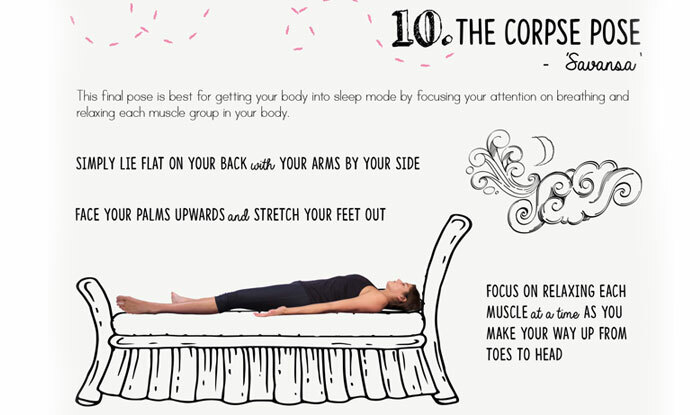 We share with you 10 yoga positions you need to try before your bed. Here are the steps on how to do with info-graphics and inputs from The Sleep Matters Club, an online magazine powered by British bed firm Dreams. 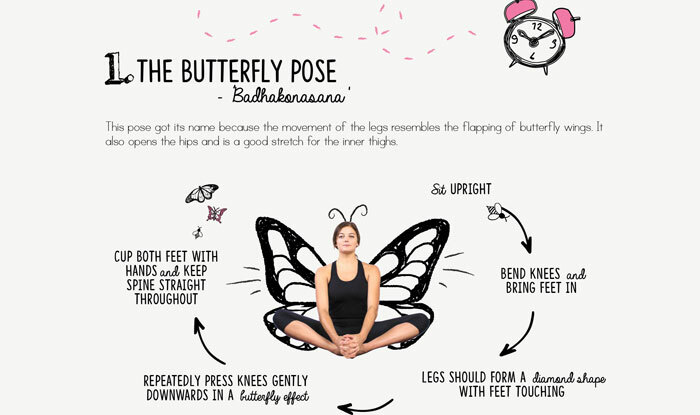 The pose Badhakonasana got its name because the movement of the legs resembles the flapping of butterfly wings. It also opens hips and is a good stretch for the inner thighs. To practice this pose you need to sit upright, bend your kneed and bring the feet in. Your legs should form a diamond shape with feet touching. Repeatedly press your knees gently downwards in a butterfly effect while you cup your feet with hands. Hold onto the pose for roughly 10 to 15 breaths. Ensure that you keep your spine straight while practicing this pose. Janu Sirsasana is good for stretching your quad muscles, it also calms your nervous system and soothes stressed mind. To practice this pose sit straight with one leg extended and fold the other foot into inner thigh of extended leg. Forward fold over extended leg and hold onto either your calf or your foot. Hold this pose for a minute. Repeat on other leg. 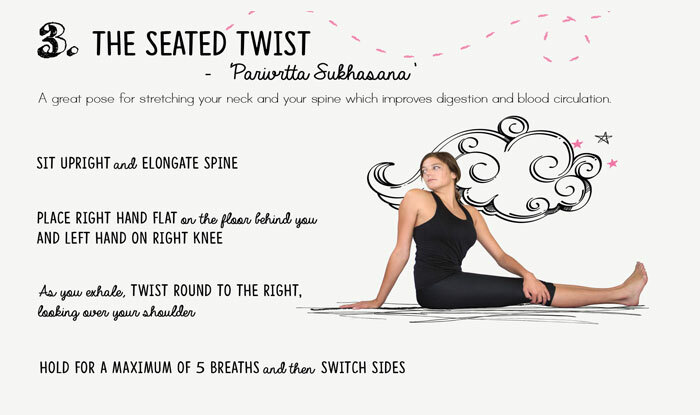 Parivrtta Sukhasana is a great pose for stretching your neck and your spine. This pose improves digestion and blood circulation, begin by sitting in upright position and place your right hand flat on the floor behind you and left hand on right knee. Twist to the right as you exhale and look over your shoulder. Hold for a maximum of 5 breaths and then switch sides. Viparita Karani is excellent for relaxation and stress relief. This pose has calming effects on your nervous system as well. Lie on the floor next to a wall and stretch legs up the wall at 90-degree angle. Attempt this pose for up to 5 minutes. This simple pose stretches your shoulders, back, hips, knees and ankles, you can do this pose comfortable sitting on a pillow. Sit cross legged and lean forward over knees with arms stretched out in front of you. While doing this, keep your forehead as close to the ground as possible. Take 10 to 15 deep breaths and then relax. Setu Bandha Sarvangasana involves raising the hips to create a sturdy bridge-like stance, this pose is especially good for your core and helps stretch the chest, neck and spine. Lie flat on back and you’re your knees with feet hip-width apart and soles flat on the floor. Gently roll pelvis upwards one vertebra at a time until hips are as elevated as possible while you keep your arms by your side and hands flat on the floor. 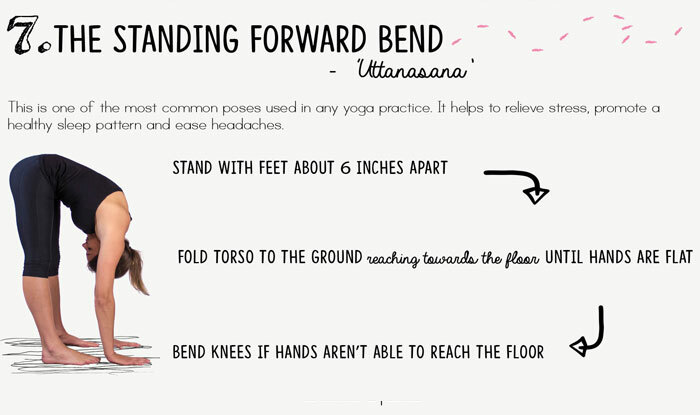 Uttanasana helps to relieve stress, promote a healthy sleep pattern and ease headaches. You will have to stand with your feet about 6 inches apart. Fold your torso to the ground reaching towards the floor until hands are flat. Bend knees if hands are not able to reach the floor. After 10 to 15 breaths relax. Halasana relieves back pain and also helps with blood flow around the body. Lie on your back and extend legs over your head. Place feet onto the ground behind you with toes touching the floor. Hands can be placed on your back or flat on the floor, depending on which is most comfortable. After 10 breaths relax. 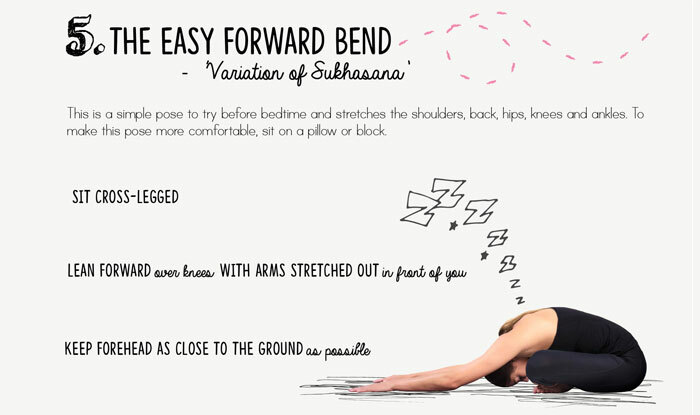 Balasana is one of the most relaxing poses and helps you to relax before you go to sleep. Sit on your knees and torso over knees with arms extended and stretching out. Rest forehead on ground and take long deep breaths. Savansa is the final pose, it is best for getting your body into sleep mode by focusing your attention on breathing and relaxing each muscle group in your body. Simply lie flat on your back with your arms by your side. Face your palms upwards and stretch your feet out. Focus on relaxing each muscle at a time as you make your way up from toes to head.